Since Apple launched ResearchKit earlier this year, we’ve seen a number of ResearchKit apps from nonprofits and academic medical centers across the country. And there’s clearly a lot more interest out there among clinicians and healthcare professionals. One way clinical researchers can help understand how Apple ResearchKit apps may improve their own work is to quickly survey how others are using this platform. 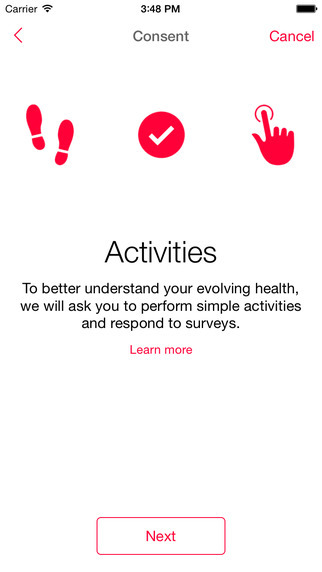 To that end, we’ve put together a guide to all of the Apple ResearchKit apps of which we’re aware. We’ll keep this list updated with new studies as they launch as well as any findings that are published from these studies. 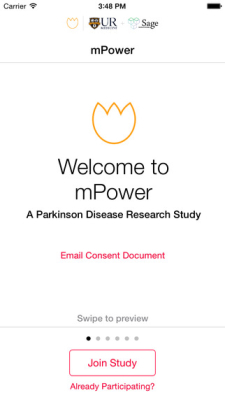 The mPower: mobile Parkinson Disease study is using a combination of phone-based sensors and surveys to collect data on patients with Parkinson’s disease in an effort to better characterize disease phenotypes and improve disease monitoring in the hopes of leveraging that information to improve outcomes. Participants will provide information on their history and symptoms through surveys and questionnaires. They will also be guided through a variety of tasks to try to objectively measure symptoms like performing walking tests, activities that involving tapping on the screen, or recording themselves saying specific phrases. A component of the study will also involve trying to use app-based strategies to promote physical activity in these patients and look for changes (hopefully improvements) in their symptoms. Only disponible in the US store, not in Canadian one.